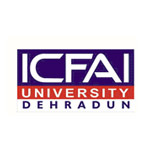 2003 as a private and self-financing institution set up by the Institute of Chartered Financial Analysts of India (ICFAI). The IU is approved by the UGC, and BCI, DCE & NCTE. The faculty of law of IU offers undergraduate and postgraduate law courses. Campus: The IU, Dehradun head quarter is situated on the Rajawala Road in Central Hope Town at Town Selaqui in Dehradun, the district of Uttarakhand. The campus is sprawled over 25 acres of land. The IU campus is 20 km away from the Dehradun City. Programmes: The IU, Dehradun conducts 22 academic programmes (8 UG programmes, 8 PG programmes, 5 PhD programmes and an integrated programme) in the field of engineering, law, management and education including B.Tech degree programme in four engineering branches, M.Tech & PhD programme in three engineering specializations. Computer Science & Engineering, Electronics & Communication Engineering, Mechanical Engineering, Civil Engineering. Computer Science, Communication Engineering, Microelectronics and VLSI Design. Faculty: The IU, Dehradun campus has a team of more than 70 faculty members from all departments. Facilities: The campus provides the well-equipped classrooms, central library, sound laboratories, workshops, internet, computer lab, conference hall, auditorium, indoor & outdoor sports facility, canteen, cafeteria, seminar hall, meditation hall, transportation and separate academic blocks for management, engineering, law and education study. Activities: The campus organizes various national seminars, conferences and workshops. The campus organizes sports activities and participates in sports competitions organized by others and conducts various co-curricular and extracurricular activities. Placement: The IU, Dehradun has a Training & Placement cell working as a joint effort of both (University & Students). The cell provides the guidance, support and network with potential employers and students put the most efforts to get this. The university has an excellent record of job placement. The Top Recruiters of the IU are as the below: AXIS Bank, Bajaj Auto, CEAT, HCL, ICICI Bank, IDBI, IFB, Kotak Mahindra, LG Electronics, Ranbaxy, Reliance, TATA Steel, The Times of India, Vodafone, Voltas, Wipro, InfoTech.